Return to Home > Pro-Gezondheid>Olimp Calcium D3 Forte 60 tabl. 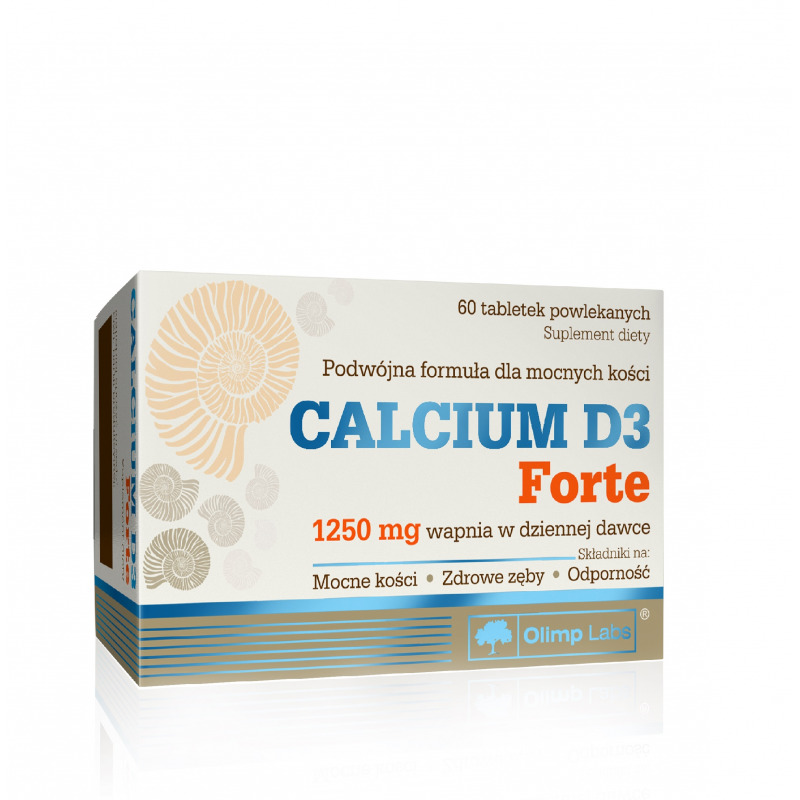 CALCIUM D3 Forte is a food supplement in the form of film-coated tablets, containing a high dose of calcium and vitamin D - components having a synergistic action important in many processes in the body. An adequate content of calcium and vitamin D in the diet is especially important during the period of rapid growth and achieving peak bone mass, during pregnancy and lactation, after fractures and injuries, as well as for women during menopause and for the elderly, in whom bone resorption processes prevail the processes of bone formation. It is noteworthy that the amount of vitamin D obtained from in-body synthesis undergoes significant fluctuations depending on exposure to sunlight, which might result in limited supply due to low sun exposure. Product is intended: as a food supplement, providing daily demand for calcium and vitamin D.
Recommended use: 1-2 tablets a day, after a meal, or according to your physician's recommendation. Tablets should be taken with an adequate amount of water. Contraindications: Hypersensitivity to any of the ingredients. In the case of nephrolithiasis, kidney failure and hyperparathyroidism, the use of this product should be made in consultation with physician. Do not use together with other products with a high content of calcium and vitamin D. Not recommended to young children due to the risk of choking. Ingredients: Calcium carbonate, glazing agents - Polyvinyl alcohol, Polyethylene glycol, Talc; anti-caking agent - Magnesium stearate, bulking agent - crosslinked Sodium carboxymethyl cellulose, Cholecalciferol - Vitamin D, pigment - Titanium dioxide. The maximum calcium intake from all sources for adults, including pregnant and breastfeeding women, is 2500 mg (milligrams) per day. The safe maximum vitamin D intake from all sources for adults and children over 11 years of age is 100 µg (micrograms) per day, and for children from 1 year to 10 years it is 50µg.